I use Microsoft Outlook 2011 as my email client. I was recently searching for an invoice emailed to me so that I could add it to an expense report. I know Outlook once had it but when I search within Outlook the message doesn't appear. Oddly enough, when I perform a Finder search, the message is there. Yet I can’t open it. What can I do? It’s very likely that between the time you received that message and later searched for it, something happened to Outlook’s database—you saw a message that the database was corrupted and needed to be rebuilt. (An issue I encounter on a nearly weekly basis.) You dutifully rebuilt the database. During that time, thinking that you had a copy in Outlook, using your iPhone or other iOS device you deleted the message from your IMAP account so that it was impossible to re-download it. 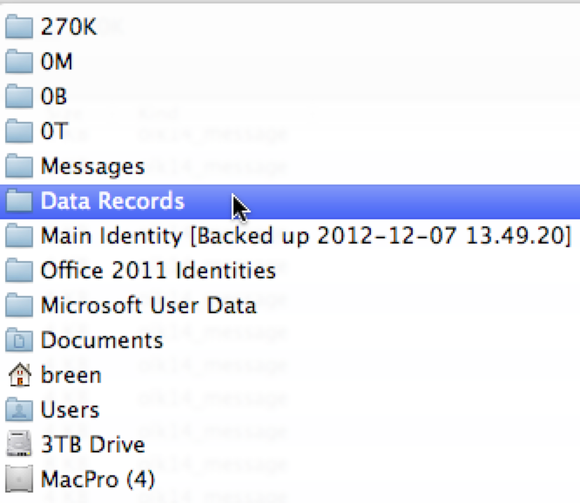 Because of that rebuild, the current version of the Outlook database doesn’t believe the message exists. However, the previous version of the database is aware of the message and has actually stored it. That’s why it appears when you search for it using the Finder. Whoops, Outlook won't open this message. But stick with me, it gets better. It turns out that you can open these files by simply changing their file extension from .olk14Message to .eml. However, if you do that and then double-click on the file, it opens but is missing the subject heading as well as the contents. You’ve performed a Finder search for this message and located it. Control-click (right-click) on it and choose Open Enclosing Folder from the resulting contextual menu. A window will open that contains several hundred messages. Your message will be highlighted. Make a note of its name—x00_270430.olk14Message, for example. Command-click on the folder icon at the top of the window so that you can see the path to this folder. It will be something like what you see in the illustration below. From this path menu select Data Records. In the list of folders that appears, open the Message Sources folder (not the Messages folder) and then traverse the same path—0T/0B/0M/270K. Recall that the original file you looked for, prior to the extension, ended in 430? If you seek that same file name, you’ll discover that it’s missing. Better now? Okay, onward. From this list of files you want the file that is numbered one less than the file that appeared in the Finder search. So, you originally found x00_270430.olk14Message. You now want to make a copy of x00_270429.olk14Message (which will be in the window) and drag it to the desktop. Finally, change that file's .olk14Message extension to .eml and double-click on the file. It will open in Outlook, complete with its contents and any attachments associated with it. And with that, let us share a healing sheesh….